Seasons are very distinguishable along the shores of the Hudson Bay in Churchill, Manitoba and on this beautiful day, the water still remains frozen as the sunset lighting glistens off the ice. 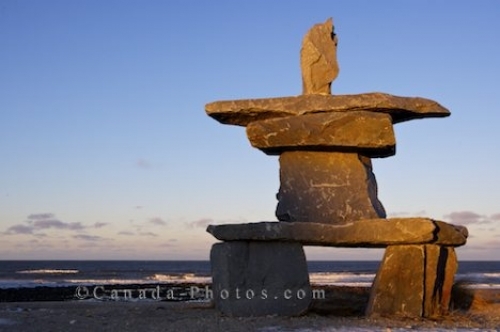 On the beach along the Hudson Bay, an Inukshuk has been built with large flat rocks and the sunset lighting highlights this symbolic formation. An Inukshuk can be made in many shapes, sizes and forms with a different meaning for each one, many which were originally used as navigational figures. Building an Inukshuk this large, takes the power of more than one person, but once completed, it looks beautiful along the shores of the Hudson Bay in Manitoba at sunset. Picture of an Inukshuk at sunset created along the beach on the shores of the Hudson Bay in Churchill, Mantoba in Canada.